Humorous, insightful, and telling, this wonderful little book is packed with poignant, witty exhortations of wisdom for couples. You'll laugh at simple reminders like: “Don't yell at each other unless the house is on fire. ” You know – the easy stuff. 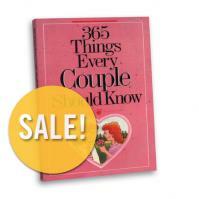 This pocket-sized book of knowledge will help spark romance, care, and pleasure in your relationship.